So I don’t think I’ve ever tried anything by Pixi before. I’ve heard lots about it in various blogs but for some reason I’ve never taken the plunge. I knew I needed to rectify that and so during a recent mini spree in Marks and Spencer I decided to finally pick something up from the brand. The first thing I noticed was the price – it’s not cheap – and so I didn’t want to take the plunge with something big like a foundation or powder on a brand I’d never used so I took a look at their lip products (because you can never have enough lippys). I really wanted a hydrating lip product that was easy to apply quickly whilst at work and found it in the Tinted Brilliance Balm. 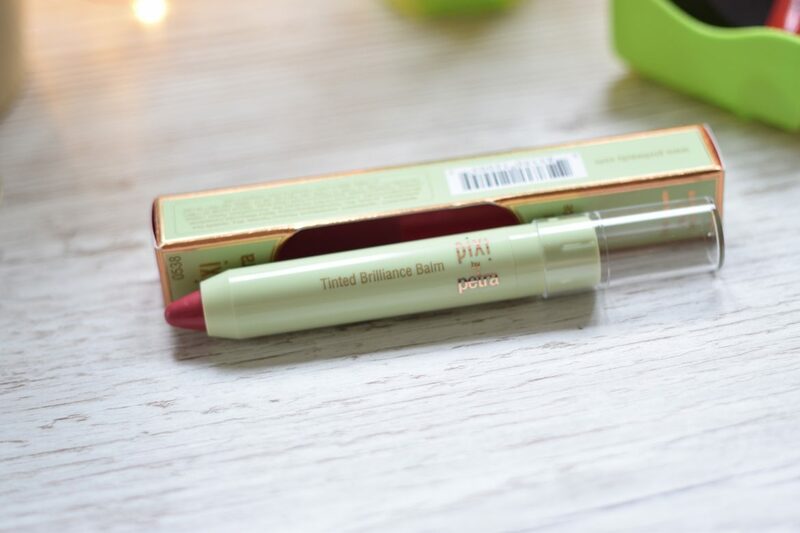 I bought Radiant Rose and paid £12 for it – though I have since found it for £9 online instead and it feels nice, sturdy and well made which I’ve mentioned before as being important to me in a lip product. They tend to get abused a little more than other cosmetic products as they get thrown in my handbags usually and so they need be tough! As you can see it has a great applicator and is really easy to use. The product itself, while claiming to be a hydrating product is beautifully soft but actually drier than a product claiming to be a balm. This may sound like a criticism but it actually isn’t. Because it’s a little drier it’s really buildable meaning I can have just a nice touch of colour, or build it up for a nice strong pink lip. The big bonus though is it actually lasts longer. I seem to have lots of balms that give a nice pop of colour but don’t really last beyond my morning coffee. This sticks around for me, pretty much until lunch time which I wasn’t really expecting. I was then worried that it might dry my lips outs but it really hasn’t. My lips can get really annoyed with wearing lip colour daily but using they’re showing no signs of drying out or getting sore. I’m really impressed with this and it’s become my daily lip colour that I apply first thing and then throw in the handbag to touch up with throughout the day. As I’m pretty impressed with my first Pixi purchase I’m definitely on the lookout for more items. If you have any hero products from the range (make up or skincare) let me know in the comments below! This post may contain affiliate links. They don’t cost you anything to follow, but they help the blog lots!